When you walk through our garden, on the surface you’ll see colorful, fragrant flowers and growing plants and vegetables but to our kids, teachers and parent Garden Master volunteers, it’s so much more. It’s a living, interactive classroom where they learn math, chemistry, biology and ecology. 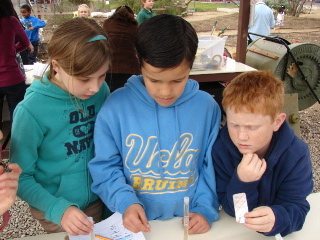 In June 2010, we submitted a grant to help fund our second and fourth grade Composting and Soil Building Project. And we’re happy to announce that last November, the California Fertilizer Foundation rewarded the TMA Garden $1,200. Additionally, BEHR Paint donated $800 towards the programs. Thank you to both organizations. With the money, 288 second and fourth graders will participate in our Composting and Soil Building Project, which provides a unique, hands-on learning experience. Each week, second grade students collect lunch food scraps to feed to the red-wiggler worms in the vermicompost bins. Weekly, the fourth graders collect and sort green and brown organic materials from around the school campus and their homes for their hot composting bins. Based upon the temperature of the compost, the fourth graders will decide whether to turn and water the compost piles. All grades will benefit from the composting accomplished by the second and fourth grade students. They’ll use worm castings, worm tea, finished compost, mulch, fertilizer and other soil amendments to build nutrient fortified soil in their garden plant beds. 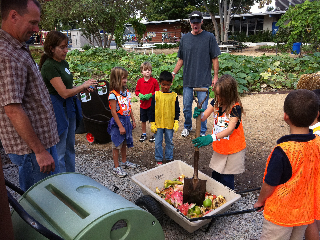 In the garden, the students not only learn about composting but have an opportunity to reinforce their math skills. This year the second graders will have an opportunity to apply the following math skills in the garden: reasonable measurement estimates, International System of Units, recording data using graphs and charts, and range and mode applications. The fourth graders will also put their math skills to the test in our garden. They’ll analyze data; define the mode, median, mean and outliers with number sets; and use a variety of methods to represent their data, including words, numbers, charts, graphs, tables and diagrams. In the garden the second grade students will also learn about plant and animal life cycles and observe that soils differ in their color, texture, capacity to retain water and ability to support the growth of many kinds of plants. They will also use tools for magnification to explore the mysteries of the vermicomposting bin. Throughout the year fourth graders will discover the role microorganisms play in the decomposition of organic plant material; ultimately creating new, nutrient rich soil for the garden. Finally, they will test the Nitrogen, Phosphorous and Potassium levels of TMA’s native soil before and after their finished compost is added.